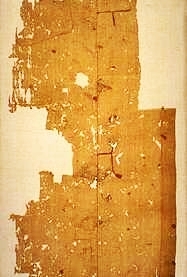 A tattered scrap of yellow silk, woven between the fourth and seventh centuries, hangs in Dunvegan Castle on the Isle of Skye, seat of the Clan MacLeod chieftains. Outsiders say that the treasure was brought from Byzantium to Norway by Harald Sigurdsson, king of Norway from 1047 until 1066. Younger half-brother to King Olaf II, Harald was a renowned general and served in the army of his distant relative Yaroslav I the Wise, Grand Prince of Rus, in a campaign against the Poles in 1031. Yaroslav later appointed Harald joint commander of defensive forces, and sent him to Constantinople, capital of the Byzantine Empire, to join the elite royal guard recruited from the ranks of the Scandianvian Rus. Harald served as captain of the Varangian Guard until 1042, when he requested permission to return to his homeland. Back in Norway, Harald made a claim for the Crown, funding his campaign with the money he had made in Constantinople. He ruled jointly with his nephew, Magnus the Good, who died in 1047, leaving Harald the sole ruler of Norway. Godred Crovan, a soldier who survived the defeat, rescued the precious banner and kept it in his possession while he sought refuge with his kinsman, Godred Sigtryggsson, King of Mann and the Isles. Goddred established himself as King of Mann in 1079, and his line ruled until 1265. It is from this line that the Clan MacLeod claims descent. Iain Ciar, fourth Chief of Clan MacLeod, was pleasant to look at and easy to talk to, and although all of the girls were attracted to him, none suited his fancy. One night, he accidentally stumbled into a fairy dwelling, where he happened upon the beautiful Fairy Princess. They fell instantly in love with each other. But when the princess appealed to her father, the king, for permission to marry the handsome Laird, her request was denied. Unlike we bean sidhe, the Shining Folk, her father explained, humans age and die. Marriage would only mean a broken heart. But the princess was so devastated with his answer that the king relented with a compromise: he would allow his daughter to go with the Laird to the human world for a year and a day. But after that, she would have to leave her husband and return to the fairy realm. The happy couple returned to MacLeod's home at Dunvegan Castle, and soon Lady MacLeod gave birth to a beautiful baby boy. The love she and her husband shared grew ever stronger with each passing day; but the days passed quickly, and her time was up before she knew it. At the end of the last day, the Fairy King waited at the end of the great causeway of Dunvegan Castle with his hosts, the Knights of the Fairy Raide, for his daughter to return to her true home. Although Lady MacLeod was heartbroken, she knew she had no choice but to leave the mortal world. Before she crossed the causeway, she hugged her beloved child to her breast, and begged her husband to promise that he could never leave the baby alone, for the sound of his cries would be too much for her to bear. The Laird kept his promise, but he was devastated. For weeks he grieved; his nights passed in sleeplessness, his days passed in silence. His kinsmen decided to throw a great feast to cheer him up, with dancing and revelry until dawn. As festive piping filled the banquet hall, the laird's spirits slowly picked up. At long last he was persuaded to join in the dancing, and he smiled for the first time in many weeks. The celebration created such a ruckus that the young maid assigned to watch the infant laird snuck out of the nursery to watch the merriment. The pipes were so loud that she failed to hear the baby awaken. With no one around, he began to cry. The Laird then spotted the young maid peeking through the doorway. Realizing that the maid had left the nursery, the laird dashed from the banquet hall. As he approached his son's room, his ears were filled with the melody of an enchanting lullaby. He peered inside the nursery and spotted his wife kissing the baby and lying him down in the bassinette. Their eyes met, but before the Laird could call to his lady, she vanished into mist. The Laird approached the bassinette and stroked the forehead of his comforted, sleeping son. His wife had wrapped the baby in a yellow silk blanket that glittered with fairy magic. That is the story the Clan MacLeod tells of how it acquired its precious treasure. They believe that the Fairy Princess had left the blanket to her son, the future clan chief, as a talisman to protect the clan. 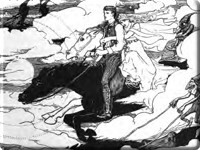 If ever it was in mortal danger, the chief was to unfurl the Fairy Flag and wave it three times, whereupon the Knights of the Fairy Raide would be summoned to the clan's defense. As the Flag only carried three such blessings, it was only to be waved in the direst of circumstances. The clan has already used up two blessings. For hundreds of years the Fairy Flag remained locked away in a safe place. Then, in 1578 the fierce MacDonalds of Uist landed a fleet of eight ships in Ardmore Bay under a cloak of heavy mist. Being the day of Sabbath, the entire local population has assembled in Trumpan Church, east of the shore, to worship. The MacDonalds barred the door and set fire in to the roof; those who tried to escape through windows were put to death by sword. Spotting the smoke from Dunvegan Castle, the MacLeod Chief assembled his men in haste. With little time to gather his knights, the chief relied instead on the magic of the Fairy Flag. As the MacLeods approached the shore, the MacDonalds rushed to their boats, only to find that the tide had gone out. Every MacDonald on the beach was slaughtered in the vicious battle that ensued. Although Clan MacLeod agrees today that the Fairy Flag only carries one more blessing upon it, no one is certain about the other time it was used. Some sources say that the clan waved it on the brink of defeat in a battle that took place in either 1490 or 1520 against their bitter enemies, the Clan Donald of the Isles. Others say that the Flag was used to save the clan from a terrible plague that destroyed so many herds of cattle the people nearly starved to death. The Fairy Flag is preserved in a glass case mounted on the wall of Dunvegan Castle. Little of it is left, for during the Second World War, Dame Flora MacLeod, 28th Chief of Clan MacLeod, snipped small scraps off the relic so that the young MacLeod men who served as RAF pilots could carry it in their wallets as they fought in the Battle of Britain. Supposedly, not one MacLeod man was shot down in the entire battle. Dame Flora even offered to wave the Fairy Flag from the Cliffs of Dover in the event the Germans tried to invade Great Britain. When Sir Reginald MacLeod, 27th Chief of Clan MacLeod, took the Fairy Flag to the Department of Textiles of the Victoria and Albert Museum in London to have it mounted in its current frame in the 1920s, Alan J. B. Wace, an archeologist from the department, took a great deal of time to analyze and study the artifact. Mr. Wace set out in great detail the factual deductions he and his team had made regarding the flag's origins (including evidence that it had been the Landoda of Harold Hardrada of Norway) while Sir Reginald listened politely. 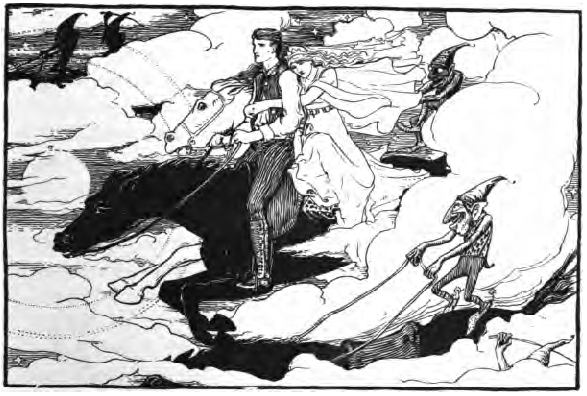 After Mr. Wace finished his explanation, Sir Reginald replied, "Mr. Wace, you may believe that, but I know that it was given to my ancestor by the fairies." To which Mr. Wace replied, "Sir Reginald, I bow to your superior knowledge."